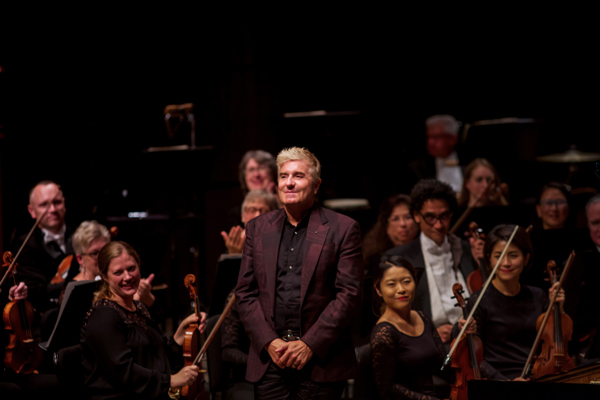 Marcelo Lehninger led the Jean-Yves Thibaudet and the Grand Rapids Symphony in one of the finest concerts ever heard in DeVos Performance Hall on Oct. 5-6. 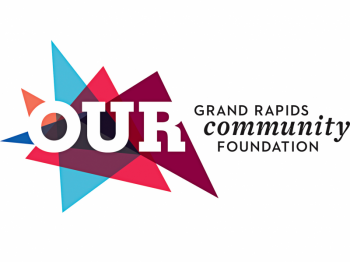 DeVos Performance Hall, since it opened in 1980s, has seen many great performances by the Grand Rapids Symphony. Friday’s concert featuring pianist Jean-Yves Thibaudet under Music Director Marcelo Lehninger surely will go down in history as one of its very best. 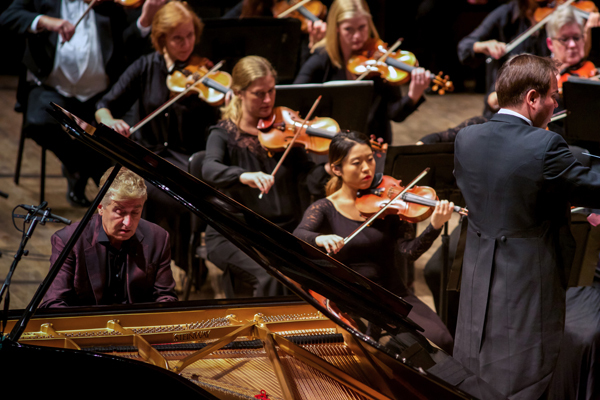 Thibaudet, Lehninger and the Grand Rapids Symphony – plus a musical saw – together conquered Aram Khachaturian’s Piano Concerto, a crowd pleasing, folk-flavored work that’s nonetheless one of the most difficult works for piano and orchestra ever composed. The DeVos Hall audience erupted in an enthusiastic standing ovation following the performance on Friday, Oct. 5. The concert repeats at 8 p.m. Saturday, Oct. 6. Tickets remain available. The Piano Concerto by the Armenian composer is so difficult and so demanding, few pianists ever touch it. It’s neglected, not because it isn’t a wonderful piece of music, but because it’s so hard to pull off. Thibaudet, one of the greatest living pianists, who opened the Seattle Symphony’s season in September with it, is its current champion. The French pianist, together with Robert Froehner, who performs on musical saw, may have been the only musicians on stage who have ever performed it before. But you would not know that from Friday’s concert. Lehninger, conducting it for the first time, led an exciting, adventurous performance, powered by Thibaudet’s incredible artistry, but solidly supported by the musicians of the Grand Rapids Symphony, baptized under fire. The evening included a masterful reading of Rimsky-Korsakov’s “Scheherazade.” On any other night, it would have been the hands-down highlight of the evening. Thibaudet, one of the living legends of the piano, regularly performs with the world’s top orchestras and greatest soloists. He’s made more than 50 recordings and is featured piano soloist in many major Hollywood films such as the 2005 film "Pride and Prejudice. 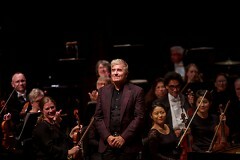 It’s due to his friendship with Marcelo Lehninger and the growing reputation of the Grand Rapids Symphony that West Michigan got to experience his artistry. He’s a bold, determined and fearless performer who tackled intricate melodic material intertwined with elaborate harmonic constructions with power and panache. The first movement final cadenza asks a pianist to do everything that a piano is capable of doing, and Thibaudet does it all superbly. 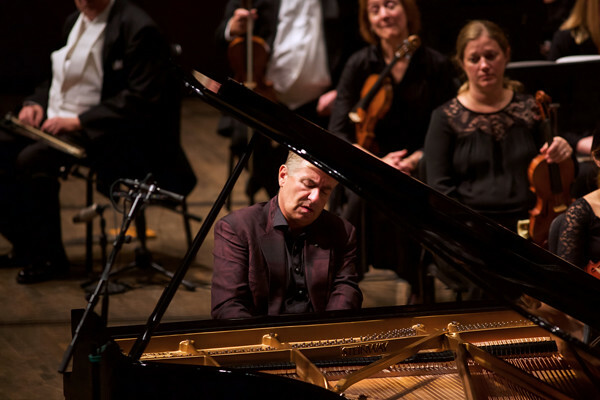 Not only that, Thibaudet performed long passages with his eyes locked on Lehninger, clearly determined to engage collaboratively with the musical forces surrounding him. Thibaudet’s acumen at pianistic color was astonishing. The soft second movement, both brittle and beautiful at the same time, was heartwarming. Khachaturian’s Piano Concerto seldom is performed, and when it is, it usually is heard without the eerie, haunting sound of a musical saw, which is the closest approximation to the instrument Khachaturian had in mind from his native Armenia. In lesser hands, the appearance of a saw in the second movement would be a novelty that lessened the gravity of the performance. Froehner’s musical skills as a sawyer were such that his presence added immensely to the beautiful performance. The final movement, dramatic, explosive and jazz-flavored, was a roller coaster ride down Mount Ararat with Thibaudet leading the way. Few pianists are capable of producing thunder in the left hand and lighting in the right hand with such ease, but Thibaudet at moments becomes an orchestra all on his own, delivering a performance of orchestra versus orchestra. Only in the end, in this contest, everyone wins. By way of a thank you, on Friday he offered an emotionally enchanting performance of Maurice Ravel’s “Pavane for a Dead Princess" as an encore. On Saturday, Thibaudet played the "Kupelwieser Waltz" in G-flat, a work by Franz Schubert that remained largely unknown until Richard Strauss transcribed it and arranged it for piano in the 1940s. It's a beautiful little piece that would be simple to play if you had three hands. With only two, it's quite a feat, but Thibadet made it seem easy as pie. Grand Rapids won’t soon forget him either. To hear a fine performance of Nikolai Rimsky-Korsakov's “Scheherazade” is to leave the hall having fallen in love with orchestral music. It’s exotic and evocative, and a guaranteed crowd pleaser. Lehninger led a sensuous performance full of exciting climaxes and gorgeous solos, most notably by concertmaster and violinist James Crawford, whose sweet violin represents the Sultana weaving her stories for the Sultan. Beguiling and bewitching are words that came to mind listening to Crawford play on Friday. But many other notable moments were contributed, including solos by clarinetist Suzanna Bratton and oboist Ellen Sherman. When you have veterans such as flutist Christopher Kantner and newcomers such as bassoonist Victoria Olson both charming the listeners in equal measure, you have an ensemble you can count on to hold an audience spellbound. With music so ravishingly beautiful, it’s easy to let a performance of “Scheherazade” slip into overwrought cliché. Lehninger conducted “The Kalandar Prince” with passion but well within the boundaries of good taste, letting the music supply the emotional content. Despite the mental and physical challenges of the Khachaturian, the Grand Rapids Symphony played its best with the “Festival in Baghdad, and the Sea,” giving full measure to its over-the-top moments as well as its subdued finale. The concert opened with Carl Maria von Weber’s Overture to "Abu Hassan," a little-known comic opera. 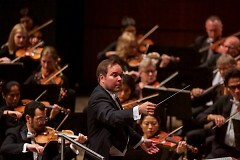 It also may have been another first performance of this work for the Grand Rapids Symphony. Nimble strings and agile winds gave a glittering start to the evening. It’s a short overture, but it was thrilling.